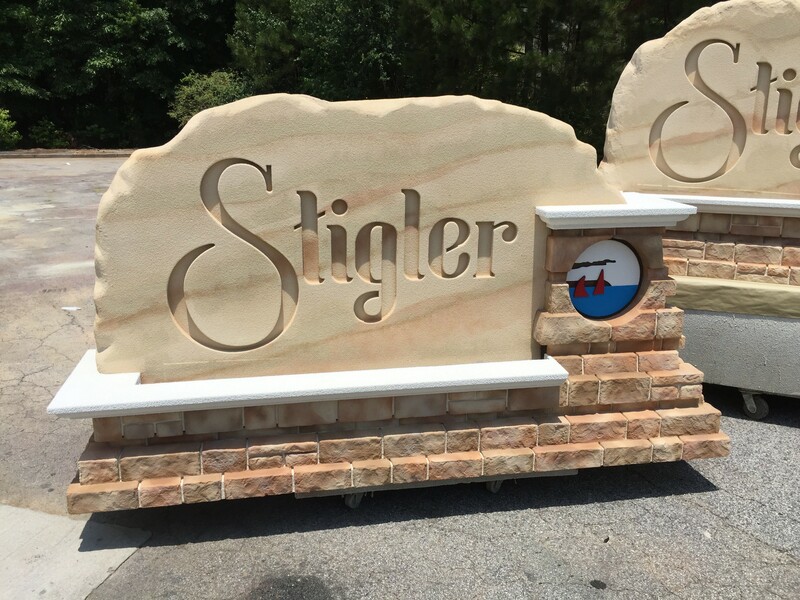 The City of Stigler, Oklahoma requested a city entrance sign monument solution that looked like their native sandstone, but with architectural accents and integrated lighting. As you can see, we offer the Best sign monument solutions nationally, hands down. 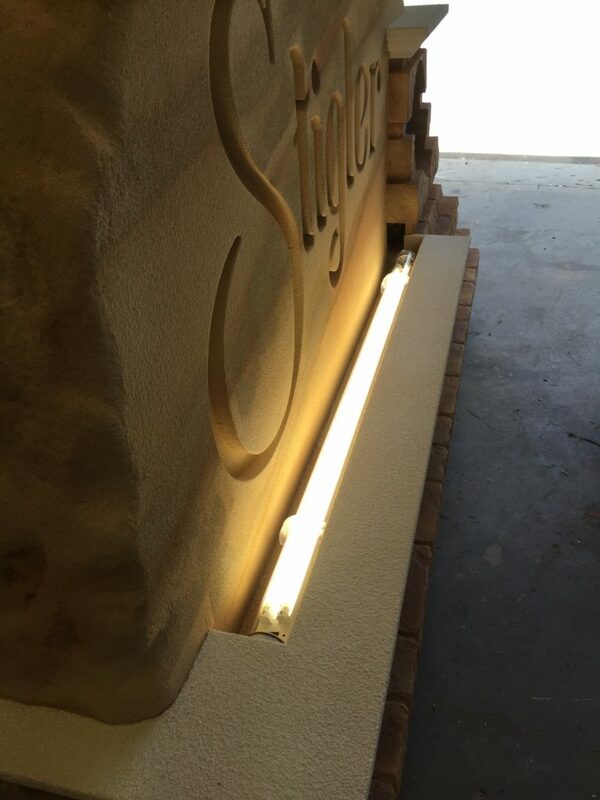 Faux sandstone city entrance sign monument with integrated lighting and embossed graphics in faux masonry. We designed the sign monument to have recessed LED tub lighting, which operates at a fraction of the costs of traditional florescent tubes – not to mention twice as bright. City Entrance Sign Monument With LED Tube Lighting. 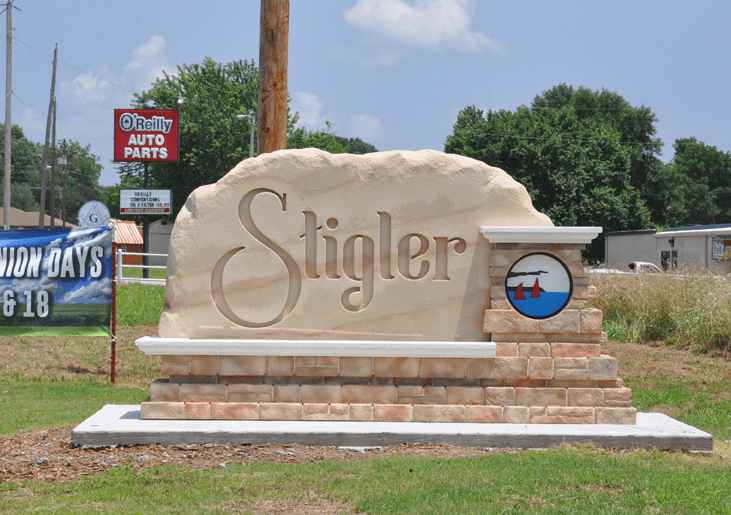 Stigler City Entrance Sign Monument Daylight View. And here is the city entrance sign monument at night time view. See how the recessed LED lighting casts on the embossed graphics? 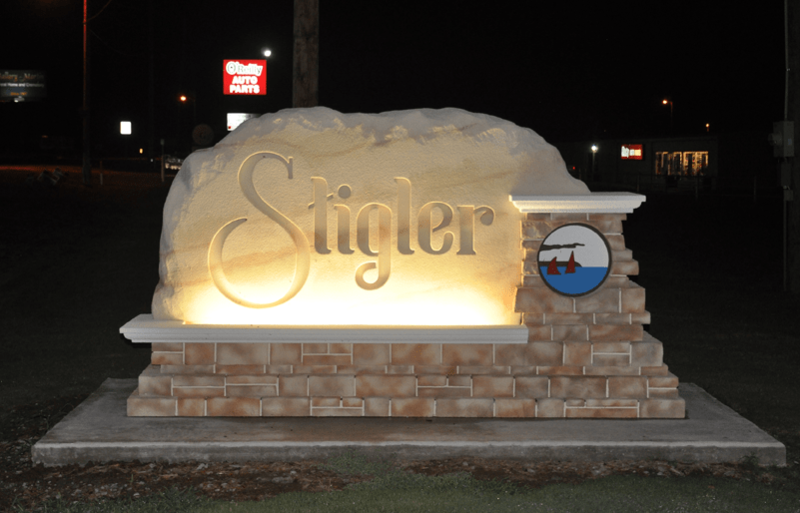 Stigler City Entrance Sign Monument Night Time View Illuminated. Please contact our Sales team for suggestions on your next City Municipality Sign Project. We have the experience under our belt, and suggestions to save your project budget. Use our Contact Form for a free initial consultation. Our team will walk you through every stage, from design to installation, making the entire process simple and rewarding. We have sign monument examples in every climate imaginable, and are already set up as approved vendors in City Planning & Development Departments nationally, making Permitting a breeze. We welcome any challenge in custom city entrance sign monument designs, and can produce anything you can imagine! Please use our online contact form to start your next sign project. This entry was posted in City Municipality Signs, Faux Masonry, Monument Signs by BSM Staff. Bookmark the permalink.